The final tournament of the season took place at King Edwards Five Ways last Friday. It is a quick play tournament in which most of the teams in the Birmingham Junior Chess League take part. All of the players who took part managed to win at least one game. 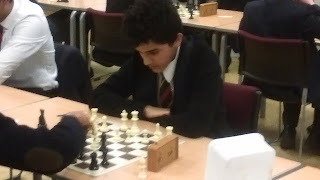 Well done to Bilal Idris, for winning 6 out of 8 of his games. 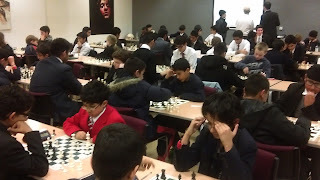 The final league matches of the season, for QM, took place at King Edwards Five Ways last Friday. The second team eventually managed to win 8 and a half to 3 and half after some very close and competitive matches. Well done to Dhiren Bahia and Amaron Singh who won both their games in their debut performances for the second team. Also, well done to Liam Berembuam for winning his match and for being the star performer in the second team this season. It was a tough night for the fourth team who eventually lost 9 and a half to 2 and a half. However, well done to Farshad Mohammadi and Zain Ashraf for winning a game each.